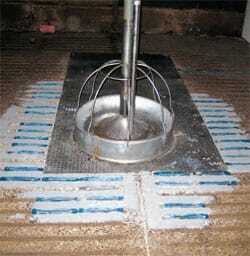 A report of BPEX trials testing new floor slot reduction and closure techniques for British pig production, published as No. 17 in its 'Research into Action' series. 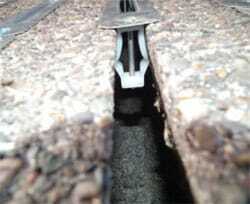 On-farm studies of concrete floors in pig buildings have found cases where the slot width exceeds the permitted maximum; often due to age or wear. UK farm assurance standards ensure that participating farms conform to the relevant legislation1. Farmers are, therefore, seeking remedial solutions and need to be confident of their efficacy. This publication refers to the first of these trials which consisted of assessing stainless steel slot reducers in four units around the country. The assessments measured the interaction of the pigs with the floor with respect to welfare and durability of the device over time. Real Welfare based assessments were used. In need of a hospital pen. three farms had partial pen treatment. To date, there appear to be no significant differences in the key welfare measures, e.g. body marks, lameness, bursae and tail biting, between pigs housed with and without the reducers. Additional measures considered, such as pigs requiring a hospital pen and the use of enrichment, were also not significantly different. It should be noted that the comparison is being made between pigs kept in pens with slot reducers installed versus the equivalent number and age of pigs in adjacent pens; the floors of these pens were often of sub-optimal condition. On some of the units, the ‘worst’ pens received the treatment (slot reducers), so the control pens may have had slats in reasonable condition. There were no consistent trends across all units and no sustained trends at individual unit level. On some of the units, all slots in treatment pens were filled with slot reducers, while on others, reducers were applied in patches to repair areas where damage was present. The manufacturer has now addressed these issues with an expanded range of products to match customers’ needs. The inserts provide an effective means for correcting floors. The inserts meet current regulations and the Defra Code of Practice for the Welfare of Pigs without any negative impacts on the pigs. Both Defra and Animal Health and Veterinary Laboratories Agency staff were satisfied that the inserts are an acceptable solution to reducing the gap width of slots. When the correct combination of length of insert, grippers and resin were used the farmers found them to be a durable solution. BPEX is continuing its monitoring over the longer term.